September 16, 2016. The cost of getting a driver’s license has become entwined with many different issues recently. It is relevant to discussions of allowing unauthorized immigrants to apply for licenses. It has come up in states that require people to show identification in order to vote and in discussions surrounding fees that are a barrier to getting a state-issued ID. And, some states have acted to reduce the burden for some groups by allowing free or reduced-cost licenses to homeless people, senior citizens, veterans, or people recently released from incarceration. 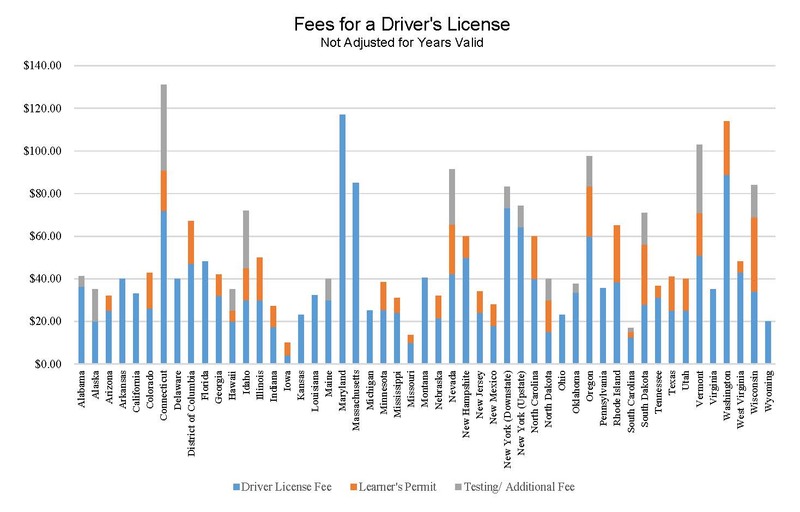 The fee charged for a driver’s license varies substantially from state to state. For instance, after adjusting for the number of years for which it is valid and other factors to make a fair comparison, we find that the cost of a license in the lowest-cost state, Wyoming, is less than one tenth of the costs in the highest-cost state, Vermont. This report lays out the fees for a driver’s license and associated costs in all 50 states plus the District of Columbia. Mandatory costs and details associated with obtaining a driver’s license differ depending on the state. The amount of time for which a license is valid ranges from 4 to 8 years. In addition, some states require one payment to cover the permit and driver’s license, others require separate fees. Some states also charge separate fees for applications and testing. There are some fees that are only applicable to immigrants, such as an additional fingerprinting fee in Utah and a higher license fee for non-citizen applicants in Colorado. Colorado charges non-citizens $79.50 for a driver’s license, which is over three times the cost of a driver’s license for a citizen applicant. Many states, such as California, Vermont, Illinois, Nevada and others, offer two different licenses—a Real ID (can be used to enter federal facilities and board aircraft) and a standard ID. The issuance of two different licenses may affect the cost of a driver’s license. A detailed list of the fee schedule for licenses in all 50 states can be found here. To organize this information into a comparable list, we added together the fees for a license, which include the driver’s license fee, permit fee, application fee, test fees and for some states a yearly renewal fee. However, not all states had each of these separate fees. Since the most common length of time for a license to be valid is four years, we adjusted all to that standard (so, if a license was good for eight years we divided the cost by two). Figure 2 shows the cost of getting the same license in different states—again, this is the full cost for a regular driver’s license, standardized to the equivalent of a license valid for four years. States that are categorized into the low fee interval were those with a cost below $25.00, the medium fee states were defined by $25.00 and above but less than $50.00 and lastly, the states which are classified as a high fee have a cost of $50.00 or more. The highest-cost state is Vermont, which charges the equivalent of $103 for a 4-year license. 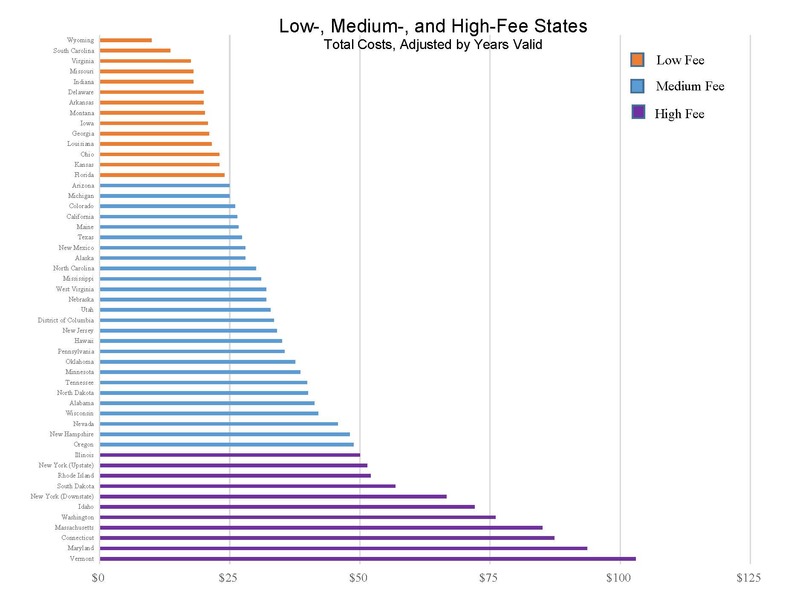 Other Northeastern states also have very high fees—Maryland, Connecticut, and Massachusetts. New York has different charges by region. Downstate New York—New York City and the suburbs that make up the Metropolitan Commuter Transportation District, has the 7th highest fee, at $66.60. And upstate New York (the rest of the state) has the 10th highest, at $51.40. The only other state to charge different fees by region is Kentucky—not included here because each of its 120 counties determines its driver’s license fees independently. At the low end of the scale, the state with the lowest cost is Wyoming with a fee of $10.00. Florida ranked the highest in the low fee states with a cost of $24.00, but ranks as the 34th state overall. Many of the Southern states, such as South Carolina, Florida, Georgia, Louisiana and Arkansas have costs that fall within the low fee states. In addition to these standard fees, there are also sometimes additional costs that are not accounted for here. States charge differing fees for renewals, for instance. We look only at regular licenses, not licenses for driving commercial vehicles, or for motorcycles. And states charge differing fees for duplicates to replace lost or stolen licenses, transferring a license from out of state and modifications made to the license, such as a name or address change. And, some states waive certain fees for specific individuals such as those in the armed forces and veterans, recently released inmates, and homeless people. Hardship licenses can be issued in some cases, in acknowledgement that individuals may need a license to care for their family even during a time when their license is suspended. States that have some of the fee waivers listed above include Alaska, Florida, Georgia, and Maine. The adjusted annual rate does not include these added costs or the fee waivers, but nonetheless gives a good basis for seeing where the fees are in each state and how the state ranks compared to others. In many states, licenses for non-citizen drivers are valid for the length of their stay in the United States, while other non-citizen drivers are required to renew their license every year. *Kentucky was removed from Figure 1 due to varying fees by county and no standard state fee. *For New York, both Upstate and Downstate, and Louisiana a range was provided on their Motor Vehicle websites. The lowest dollar amount was used from each range as the cost of a driver’s license. *For license or permit fees that included a yearly renewal fee, the fee was added once to adjust for the initial fee of the license or permit. The states with yearly renewal fees include Iowa, Maryland, Tennessee and West Virginia.